The #whyilovephilly party returns bigger and badder (or just bigger and with a lot more love) than ever. Philly Love Notes, The Arden Theatre Company, Drink Philly and Philebrity are hosting a night of food, booze, music, performances, and general merriment in the name of celebrating all that Philly has to offer. Located in the Arden's newest space, the party will feature the finest parts of Philly, including contributions by you, of course. This party would not be possible without our sponsors, who love Philly as much as we do. 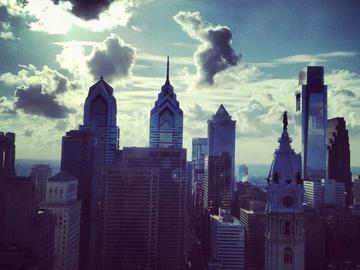 They include leading sponsors Visit Philadelphia, PHLCVB, and Philadelphia City Paper. Other sponsors incluge Uber, the Marc Hammarberg Group, Philadelphia Parking Authority, Newsworks, Free Tours by Foot, The Sixers Cave, P'unk Ave, Freckle and Flying Kite. So register, spread the word, give some love to our sponsors, get your own Philly love together, and enter our Instagram contest by tagging your photos #whyilovephilly and #whyilovephilly_13. We'll be choosing the top 8 photos for love note postcards and take home prints. AND...if you're looking for a way to get to the event, Uber is offering all new users a FREE Uber ride up to $20 using the promotional code below. Check it out because Old City is going to be packed on First Friday. In case you don't know, Uber is an iPhone/Android app that lets you tag your location and summon a professional driver to your side within minutes. Once in the car, the driver will take you wherever you need to go.The fare is billed to your card, with no need to tip, so you don't have to worry about handling cash. Just click the promo code below and sign up! You'll be riding in style in no time at all.